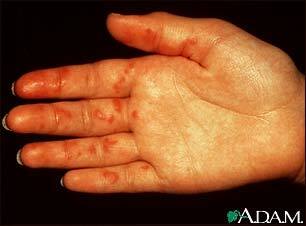 These spots of blood under the skin, called purpura, are caused by vasculitis. They do not turn white with pressure (non-blanchable). In this particular case, the purpura are associated with an underlying disorder affecting the structure of the blood vessel walls called collagen-vascular disorder.